You never forget your first and that will definitely be the case with the launch of my debut middle grade At Your Service last summer. But what I failed to take into account is that there are always new firsts to look forward to and celebrate. 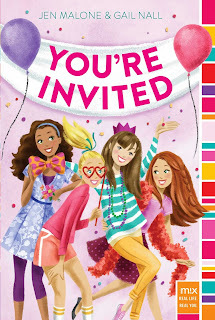 You’re Invited, which comes out tomorrow, is both Gail and my second books, but our first time writing together. The process has been crazy fun (and crazy crazy), and you can read more about our process here. But for today we thought we’d keep it fun by interviewing each other about, well, us. So, Gail, what was your favorite part of co-writing You’re Invited with me? Gail: Making each other laugh! Thinking up something to try to top what you'd written in the chapter before was the best part. Second maybe to reading your comments on what I'd written. Oh, and reading your new chapters! It was like Christmas that lasted for a really, really long time. And our three-person phone calls with Amy (our editor). What am I talking about? I loved it all! Did you? Jen: Yup. Much more than I thought I would*, for all the reasons you just listed. I felt like I was writing my chapters for you as opposed to having some vague image of a someday reader in mind as I typed. I giggled out loud when I wrote lines I thought would make you laugh. *I mean, I didn’t have low expectations, I just didn’t have any expectations because I couldn’t quite picture how co-writing a book with someone would work. Me neither! So, what was your least favorite? Jen: The funny thing is that I was only writing fast because I was terrified of being the one holding up the timeline. Left to my own devices, I’m really lazy. I’m pretty sure I invented binge-watching… I would say my least favorite was falling behind on Game of Thrones. Just kidding. It was probably how long copy edits take when two people need to weigh in on every sign-off. But that’s just being nit-picky. Okay, Gail, here’s where I put you on the spot: what is your favorite scene in the book? Gail: The Dread Pirate scene, hands-down. It makes me laugh, every single time. I feel like we should get matching costumes, complete with stuffed parrot, and wear them to an event some time and talk like Becca. People would come that, right? Jen: Um… yes? Yes! Of course the two of us in pleather pants would be a draw? Or perhaps a vine that goes viral, one or the other. I loved that you picked a scene I wrote because my favorite is a scene you wrote. Well, actually a slew of scenes that feature the funniest characters of all time, Bubby (Lauren’s crazy—and desperate to be hip—grandmother). I think I literally rubbed my hands together in anticipation any time she made an appearance on the page. Which of our characters would you want with you in the event of a Zombie Apocalypse? Gail: Hmmm... I'm going with Lauren, because while I'm freaking out, I feel like she'd find a way to outsmart them. You? Jen: Easy peasy. Bubby. Did I mention I love Bubby. She’d kill me with laughter way before the zombies got to me. I’d rather go out that way any day! Zombies, pleather pants, and pirate talk- I'd sat this has been a successful interview! We'd love for you to celebrate You're Invited's release with us this week. Check back for more fun!